The Pained Ink Slayer: Spring Devotions of the Broken Body Book Series Launches. See what the inside the cover reviewers have to say, you will be inspired. Spring Devotions of the Broken Body Book Series Launches. See what the inside the cover reviewers have to say, you will be inspired. Sometimes we feel alone and isolated. Sometimes we forget that for every healthcare provider that doesn't believe us or in us, there are two that do. Following are the reviews that are inside the cover. "Write a Customer Review" button. It shows your support, which as authors is important to us; it is what motivates us. "We are all subject to the slings and arrows of outrageous fortune; they are around us, in a space we do not control. This book is a gentle, yet forceful reminder that the best defenses against them reside within- in a space we do control, welling up from resources we can learn to cultivate. Hope here is equally soft and irresistible, much like Spring itself." "This is a truly beautiful book. It offers healing medicine for the body, the mind, and the heart. It will soothe your body with its many practical tips for minimizing physical pain. It will open your mind to new ways of framing your experience so you can live a full and purposeful life despite your health challenges. It will open your heart to your potential to be kind and loving so you can wrap yourself in a cloak of compassion for yourself and others. This is a book to keep close by, always." "The spring Devotions is like a relaxing massage for the mind. Filled with comfort and words of wisdom, it is a wonderful journey through the season, providing hope in the power of one’s own ability to travel to a place of healing. I wish I could give a copy to each one of my patients." "Celeste and Jeff have produced another gem. For those currently disabled by pain and poor health this is a traveling companion to lighten your load, and it is from someone who is on the same path. Celeste has lifted herself up from her own illness to reach out to others with compassion. Her strength amazes me. She is an inspiration to me. This beautiful book is filled with valuable advice, wisdom, and generosity of spirit. It belongs in the pocket of all who suffer, and all who care for them." Dr John Whiteside, MBBS, Fellow of the Australasian College of Nutritional and Environmental Medicine. "Celeste Cooper and Jeff Miller have given us a great way to begin our day. As a chronic pain patient, I take one day at a time facing new changes and challenges. Spring is a season full of new beginnings and opportunities and this book combines stories, pictures, prose, and quotes that motivate us, inspire us, and provoke us to answer questions that challenge us to look both internally and externally. The authors encourage us to journal, and by doing so, commit us to a positive, healthier self. Spring Devotions provides us the necessary tools for our arsenal in the combat against chronic illness." "Broken Body, Wounded Spirit Balancing the See-Saw of Chronic Pain" one of four seasonal daybooks' holistic approach to chronic pain challenges is a powerful tool to everyone dealing with these issues. It is a self-empowerment tool, making you the cartographer in the adventure of your evolving future. My 20 years of working with people challenged by chronic pain issues have revealed to me just how deeply the mind, heart (emotions), and body are intertwined and how a holistic approach is a powerful one. Often our mind drives us to push, push, push because of old programming in our lives. This habit overrides the body's requirements, and needs to be untangled. This book will support and help you get back in touch with your body', so you can become an 'ally' rather than a brutal taskmaster. You can re-learn how to 'play' with your body, rather than dictating to it. This book's advocacy of Tai Chi is just one of the many insightful and valuable gems it has to offer everyone dealing with chronic pain." Bill Douglas, author of "The Complete Idiot's Guide to T'ai Chi & Qigong," 2009 Inductee to the Internal Arts Hall of Fame in New York, and Founder of World Tai Chi & Qigong Day. This, the last of Celeste and Jeff's four seasonal devotions books, may just be the best of all. From its practical suggestions to its inspirational quotes and photos, Spring Devotions offers chronic pain sufferers daily bite-sized, easily digestible tidbits that educate, encourage and empower us to take control of our health and our lives. And as someone who likes to jot down personal thoughts in my devotionals, I especially appreciate the extra space for notes. 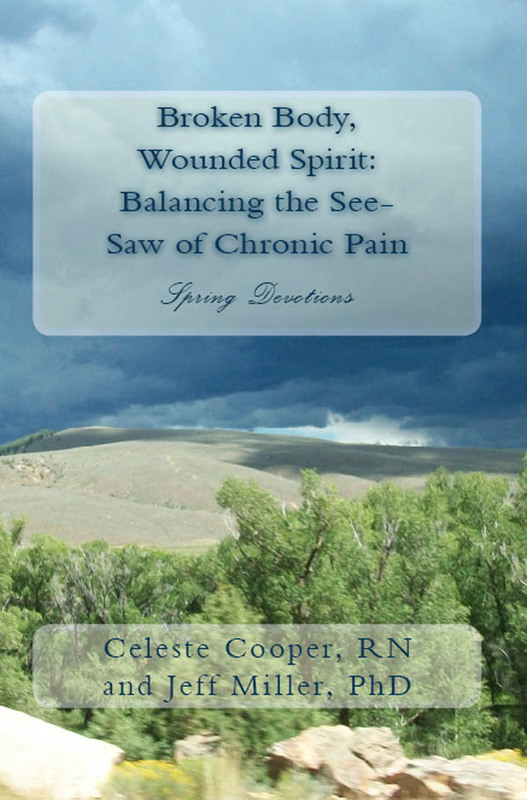 All in all, Broken Body, Wounded Spirit...: Spring Devotions is a valuable asset for anyone living with chronic pain. "As a neurosurgeon committed to treating people in pain, I am often consumed with the technical details of interventional procedures. Celeste Cooper and Jeff Miller, in their beautiful book Broken Body, Wounded Spirit: Balancing the See-Saw of Chronic Pain, Spring Devotions, remind doctor and patient alike that true healing comes from the mind-body balance that can only be achieved from within. I recommend this inspirational work to all who deal with pain, especially in circumstances that call for using advanced technological treatments, to help them center the psyche and recruit the spirit in the journey toward health." "Too often, we respond to chronic pain is by looking outside of ourselves to find cures, as dictated by our predominant biomedical model, overlooking the innate ability of our bodies to heal themselves, if we just “get out of the way”. This beautiful book is chock-full of guidance for doing just that: accessing the still, small voice inside so it can guide us to healing. It reminds us why we really need to use a 'biopsychosocial-spiritual' model of pain. Thank you for this valuable resource!" "The Pain Action Alliance to Implement a National Strategy (PAINS) is dedicated to transforming the way pain is perceived, judged and treated. With more than 100 million Americans living with chronic pain, this book will play an important role in that transformation, especially for those living with pain. 'Spring Devotions' offers hope, inspiration, and education. Thank you, Celeste and Jeff!" "Chronic pain can be devastating and all consuming. In Broken Body, Wounded Spirit: Balancing the See-Saw of Chronic Pain. Spring Devotions, patients will find a way to cope with pain and thrive in spite of it. The lovely quotes, beautiful pictures, and words of wisdom are inspiring. The information and workbook give a step-wise approach for practical ways to lower pain levels and make it more manageable. Following the daily devotions makes it easier to deal with pain in a thoughtful manner, which does not overwhelm. What is this book about? This book allows us to cleanse ourselves of isolation, rejection, self-loathing, anxiety and a myriad of other symptoms of inappropriate coping. We will embrace change and perpetuate healthy strategies that improve our relationships with others, and give us hope as we bud into a new way of thinking. Read this book and you will." Dr Robin Miller, MD, Sharecare Editorial Advisory Board Member, Internal Medicine and serves as the medical director of Triune Integrative Medicine in Medford, Oregon. She has produced the award-winning health series, "Is there a Doctor in the House", Â, and is the author of "Kids Ask the Doctor" and the co-author of "The Smart Woman's Guide to Midlife and Beyond: A No-Nonsense Approach to Staying Healthy after 50". Left out the word "every" as in: Sometimes we forget for "every" health care provider..
Maybe you could pop for an editor!. TY Grammy for the catch. The book was proofread and edited. This mistake is because of me, the blog, and not part of the book. I appreciate you input because chronic pain takes a toll on all of us and my brain can get a little sideways. Thank you again. Noted and corrected.